Bestival, a music festival based in southern England. The festival, which is part of a series of European festivals every year, will greet the music lovers in Indonesia this year, 2017. Carrying a concept similar to Glastonbury and Fuji Rock Festival, Bestival visitors can camp at the venue during the festival. Held Bestival in Asia, one of them in Bali, Indonesia. 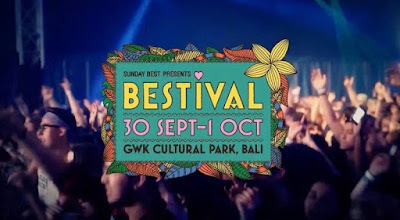 Bestival Bali will present the line-up of local and international contemporary and international musicians, Rudimental, Alt-J, Purity Ring, Stars and Rabbit, Ras Muhammad, and many others. Bestival Bali 2017 will be held on 30th September to 1st October 2017. The event will be held at Garuda Wisnu Kencana Cultural Park (GWK), Bali. The breathtaking scenery in Bali's tropical landscape is considered a suitable place for this festival. Also Bali has successfully held various international music festivals. Clothes are also a tourist destination for holiday and fun. Often referred to as the wonderland festival escapist, Bestival will spoil the visitors with a wide range of amenities such as a fancy cocktail bar and snack market, both local and global food for 2 days. Bestival Bali presale ticket starts from Rp. 2700000. For those of you who want to take a break and have fun with friends at music festivals, Bestival Bali is an agenda that should not be missed. While on holiday to Bali and enjoy the tropical feel yet with high humidity, Bali is a good place to have fun.